Handmade cement tiles are an easy-to-maintain product that not only offer deep colors and a rich history, but most importantly, they offer long-lasting beauty and extensive design possibilities for floors and walls. From bold tile patterns in contrasting colors or classic cement patterns in harmonizing colors, the resulting design is certain to transform the look and feel of any space. To that end, we’ve assembled dozens of image-filled cement tile projects and ideas onto our Design Ideas Portfolio. With dozens of Cement Tile Design Ideas in our portfolio, we're sure you'll be inspired! Our extensive portfolio of design ideas will show you how handmade cement tile can be used on floors, wall, ceilings, backsplashes, as a tile rug, wainscoting, mural, or in or around a water feature. Because of their natural slip-resistant qualities and versatility, cement tiles are perfect for flooring a bathroom, kitchen, dining room or outdoor patio. Our Houzz Ideabooks offer a glimpse into the endless possibilities when designing with handmade cement tile. Additionally, we invite you to explore the world of cement tile via our Pinterest boards Cement tile floors/walls, and Cement Tile Rugs. Cement tiles are used all over the world in countries such as Cuba, France, Spain, Portugal and more. 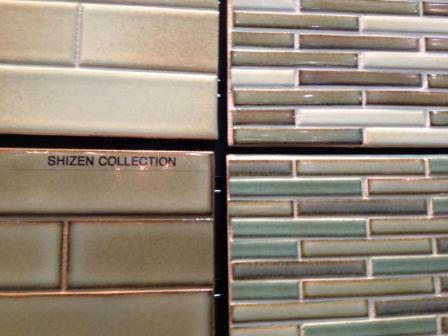 Our Houzz Ideabooks also offer various settings and applications for handmade cement tile. Creating a custom pattern takes time. There is time to work out the design of the pattern, choose the colors, and create virtual designs with options. Most importantly, you need time to decide what looks best and is right for you. Then, once the design is final, more work begins. A mold needs to be made for the pattern and a strike-off or sample tile is created using the mold. This allows you to verify the pattern, color, and design before a full-order. 2-3 weeks - Pattern development in black and white with several iterations. 1-2 weeks - Color choice and placement with several iterations. 2-3 weeks - Create mold. 2-3 weeks - Create strike-offs and ship for approval. Hopefully, you now have a better understanding of why it takes so much time, and the increased costs involved, in creating a custom handmade cement tile. 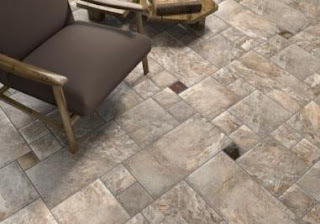 Rest assured the end result of the time and effort of invested in creating a one-of-a-kind tile product is well-worth it! Have we inspired you? Where would you use our handmade cement tile? 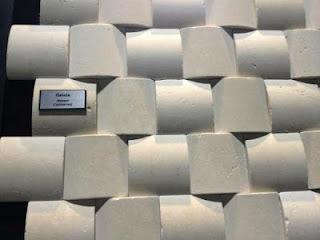 Tile of Spain's exhibit at Coverings 2013. 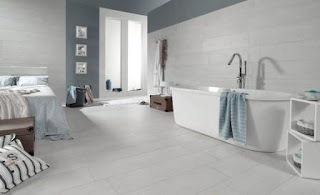 Image courtesy of Tile of Spain. Ceramic tile use throughout Spain is prolific. 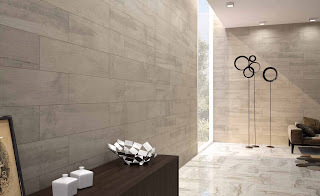 Not only can it be seen on the floors and walls of Spanish churches and palaces, but ceramic tile also plays an integral role in the everyday functioning of modern homes, hospitals, educational centers, hospitality and commercial applications. At Coverings 2013, held recently in Atlanta, the Tile of Spain marked its 26th year in exhibiting Spanish innovation at the annual tile and stone show. 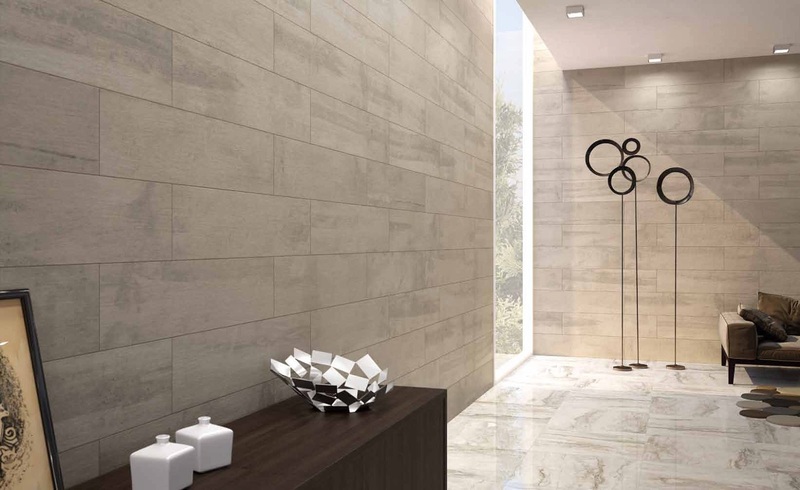 The Tile of Spain international brand represents 125 ceramic tile manufacturers belonging to the Spanish Ceramic Tile Manufacturers’ Association (ASCER). 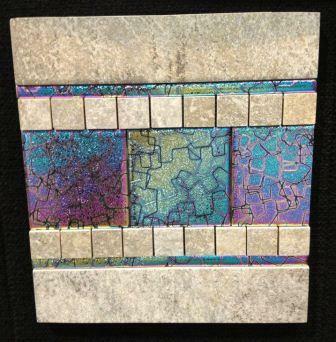 Tile of Spain's pre-Coverings catalog of the 43 ceramic tile and stone manufacturers slated to exhibit at the show. Collectively, the advanced ceramic tile technology and architectural/design solutions presented during Coverings by 43 Tile of Spain members made an unforgettable, awe-inspiring impression for any visitor of the expansive pavilion. Further, true to their eco-friendly stance, Tile of Spain’s Spanish Pavilion booth was constructed of 100% recycled cardboard and organic dyes. 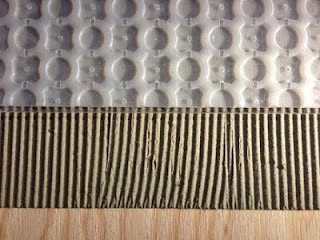 “Made by the company ECOWALL, it was created with modular cardboard pieces joined together by small connectors. 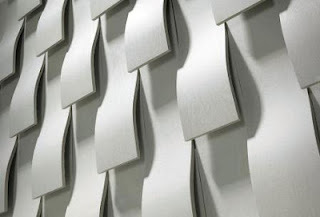 The use of ECOWALL reduced the costs of transportation, building, storage and is environmentally friendly,” Tile of Spain noted. Now, here are some of the highlights of the ceramic tile products seen at the Spanish Pavilion. I hope you enjoyed this brief walk through the Tile of Spain Pavilion. 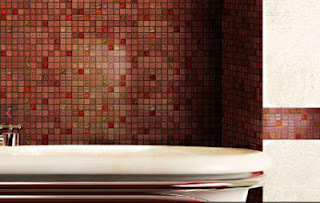 For more information about these and additional Spanish tile manufacturers, please visit www.tileofspainusa.com. 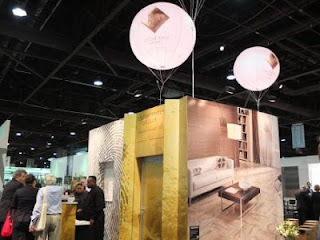 Remember, Coverings 2014 will be held April 29 through May 2 in Las Vegas at the Las Vegas Convention Center. Hope to see you there! Finally, for additional sources for Spanish, Moorish and Arabesque ceramic tile designs, colors and formats, check out Avente Tile. So, which is your favorite tile? How and where would you use it to fit your design and architectural needs? Similar in their hand-crafted workmanship to our line of Arabesque Spanish Cement Tile, our Clay Arabesque Ceramic Tile collection pays homage to its Moorish and Spanish tile roots with deep, rich colors and intriguing geometric shapes. The clay Arabesque tiles pictured above are from Aljafería Palace, a fortified medieval Islamic palace built during the 11th century in Zaragoza, Spain. As you can see, hand-crafted clay bisque tiles are truly timeless elements. 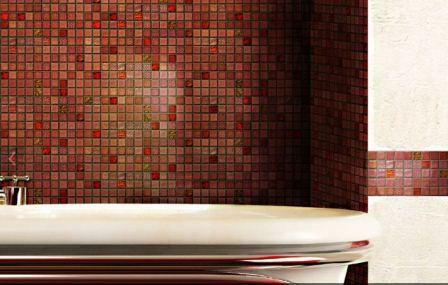 Further adding to its inherit rustic appeal is the fact that our decorative, hand-painted Clay Arabesque Ceramic Tile is produced using a classic extruded red clay body. Using this method of production only enhances this collection.s appeal. 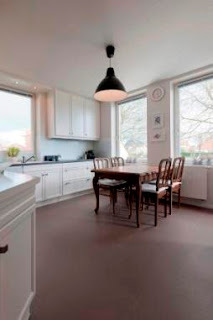 Manufactured in the USA, these high-fired classic terracotta tiles offer unsurpassed flexibility as they can be customized for any décor need with traditional unglazed bisque colors, glazed bisque colors, glazed blends, and more than 50 studio glazes. From contemporary to rustic, our Clay Arabesque Ceramic Tile collection is sure to fit any need in any setting whether it.s for walls or floors, indoors or outdoors. There are 6 designs within this collection. 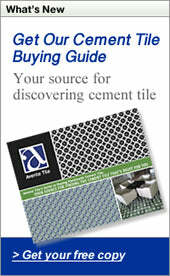 Our online product catalog details the available styles, tile sizes, shapes, formats, color, and price for each design. Remember, each piece is handcrafted, therefore, please expect to receive them within 4 to 6 weeks from the time your order is placed. 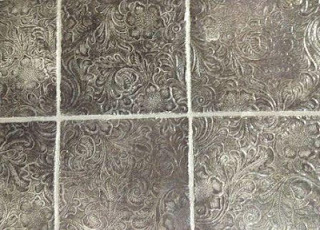 Lastly, by using our Clay Arabesque Ceramic Tile in your next design project, you'll feel good knowing your choice is also good for the environment. Along with being made in the USA, this collection is made using clay sourced from California and includes 33% recycled post-industrial content. Our Ceramic Tile FAQs section should help answer any questions you may have. If not, please feel free to call our office at 888.739.4972. 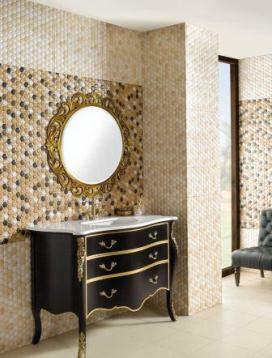 Spanish ceramic tile conveys warmth and instills Old World ambiance in any environment. With centuries-old tile designs, our versatile Spanish ceramic tile collection includes borders, corners, large decorative tiles and accent dots. It.s because of its inherit versatility and stunning colors that homeowners Buck and Marsea Ryan chose our hand-painted 6"x6" Cadiz Spanish Ceramic Tile series for their kitchen backsplash. The Ryans, who live by the Maine coast near Acadia National Park, chose the vibrancy of Cadiz to add much-needed focal points to the white tile backsplashes behind their oven and kitchen sink. We think the unexpected pops of color and patterns have added interest and energy to these spaces! You can read the complete story about this project on our Avente Tile Talk Blog. Spring is definitely in full-swing with an energy like no other season. 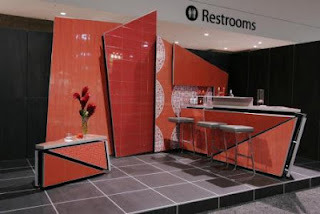 For this month.s Pinterest focus we chose our boards that focus on the color orange for vivid exuberance, and of course Spain for highlighting the unveiling of our new Clay Arabesque Ceramic Tile colelction. With that energy comes the overwhelming urge to remove the layers of wear and tear that have compiled over the years. It.s time to take on a project that has been set aside for years. Now is the time for renewing not only your home and living areas, but also a time to renew one.s appreciation for the little things. Whether you embark on a small or large project, Avente Tile is here to help you any design goal, and for any budget. Our extensive Design Ideas gallery features a large collection of projects that incorporate our handmade and hand-painted ceramic tile, cement tile, decorative tile, mosaic tile, and so much more. So, how can we help you? 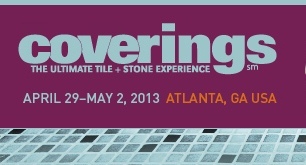 Coverings 2013 lived up to, and exceeded, all expectations as THE Ultimate Tile + Stone Experience. The four-day event, which concluded last week, was set in Atlanta for the first time in the show’s history. With that, more than 900 exhibitors from over 50 countries packed the aisles of the Georgia World Congress Center with the latest, most innovative stone and tile products. If that weren’t enough, the organizers of Coverings also offered a wide-ranging conference program comprising more than 70 informative seminars and demonstration sessions targeting every segment of the industry, all free of charge, and many with CEU credits. Session topics included Social Media, design, exterior façades, stone fabrication, installation methods, and more. There was definitely something for everyone, and everyone was definitely engaged! Of course, Coverings and its exhibitors have always aimed to please their attendees. This edition of the show did that, and more, with everything from micro-mosaics to large-format tiles. Texture was definitely a trend this year, as was the vast selection of attention-grabbing vibrant colors, or the subtle statement of shapely white tiles. Here’s just a sampling of what was available on the show floor. I’ll delve deeper into patterns, textures and sizes in future posts, so enjoy these beauties in the meantime. 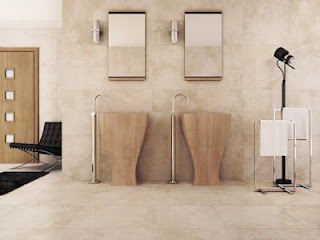 Porcelain tile that mimics polished stone from Fiandre Architectural Surfaces. 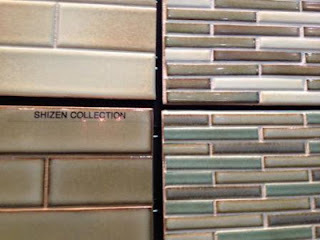 The Shizen collection from Bedrosians Tile and Stone. Coatings by Sandberg features an aviation industry inspired coating. New shapes and textures from Interceramic. Galala dimensional stone from Marmi Natural Stone. 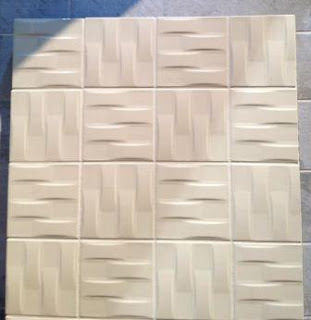 Handmade cement tile by Tiles Couture. Within the last couple of years, and more so for the 2013 edition of the show, Coverings stepped up its efforts with its social media presence. As a result, the indisputable nerve center of the show was Coverings Central. This interactive and vibrant area was strategically located on the show floor. 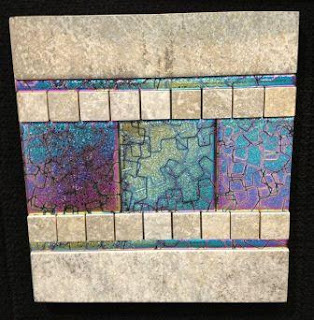 Home to many Quick Fire sessions that addressed both social media and complementary industry topics, these 20-minute sessions highlighted the synergy between the tile and stone industries and social media. It went above and beyond its purpose by engaging attendees within the various Social Media channels, as well as helping those who needed a bit of help in getting started. Coverings Central, the show's social media hub. 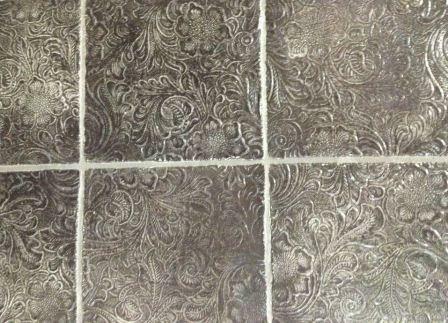 Now, what would Coverings be if it weren’t for the beautiful tile and stone designs? More importantly, what would those products be without proper installation? Here are a couple of places where design and installation was the belle of the ball! Installation Design Showcase: Now this was the place to be if you wanted to see masterpiece-worthy collaborations between NTCA Five Star contractors and Atlanta-area design firms. These partnerships produced beautiful designs and with highly skilled installation techniques. This year’s vignettes include a bar/lounge, hotel lobby, inpatient room in a women’s birthing center, and a master bathroom – all created, from start to finish, right on the show floor. Installation Design Showcase: Bar/Lounge. 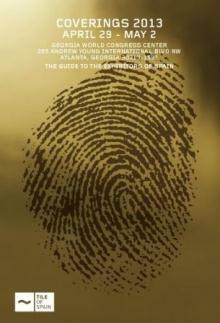 Image courtesy of Coverings. Installation Design Showcase: Hotel Lobby. 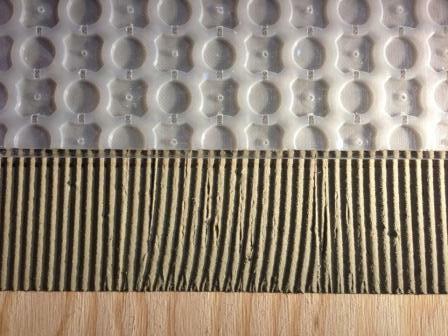 Image courtesy of Coverings. Installer: Rod Owen, C.C. 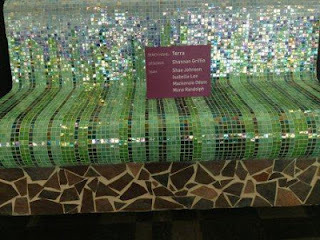 Owen Tile Company, Inc.
SCAD Tiled Bench Exhibit: Coverings teamed up with the Interior Design Department at the Savannah College of Art and Design (SCAD) where through a 10-week course, talented students learned how to design and tile six benches. These gorgeous benches were displayed for all the attendees to see as they passed through Halls B and C. After Coverings, the benches were moved to their permanent locations on the SCAD campus. Students of the Savannah College of Art and Design (SCAD) created tile benches. 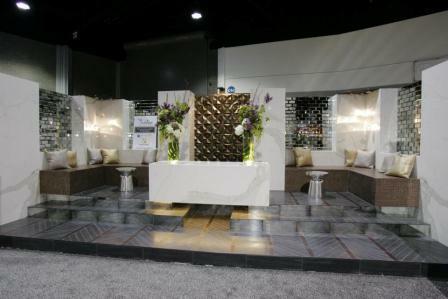 I hope you’ve enjoyed this brief glimpse of what Coverings 2013 offered. 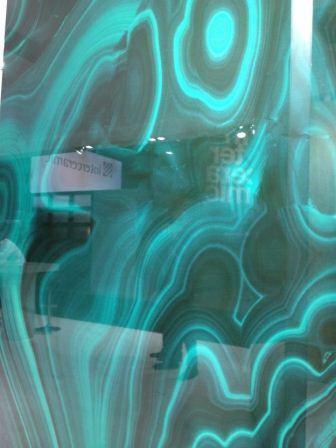 With so many new installation products, as well as new tile and stone designs unveiled at the show, I’ll be highlighting something new in future blog posts. 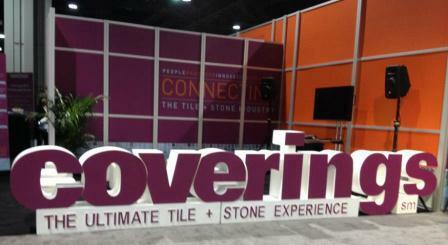 Lastly, did you know that plans are already underway for Coverings 2014? It’s already set for April 29-May 2, 2014, at the Las Vegas Convention Center in Las Vegas. Make sure to include the show in your 2014 plans! Coverings is sponsored by several associations, including Ceramic Tile Distributors Association (CTDA), Tile of Spain/Spanish Ceramic Tile Manufacturer's Association (ASCER), Ceramics of Italy/Confindustria Ceramica, National Tile Contractors Association (NTCA) and The Tile Council of North America (TCNA). The show is managed by National Trade Productions. For additional information, please visit www.coverings.com, or contact National Trade Productions, Coverings Show Management at 703-706-8257. NOTE: Unless otherwise noted, all images are the property of Arpi Nalbandian. Please contact her if you would like to use these images.